By Craig | October 18, 2018 | This post may contain affiliate links, which means we may receive a small commission, at no cost to you, if you make a purchase through a link. Read our Disclosure. 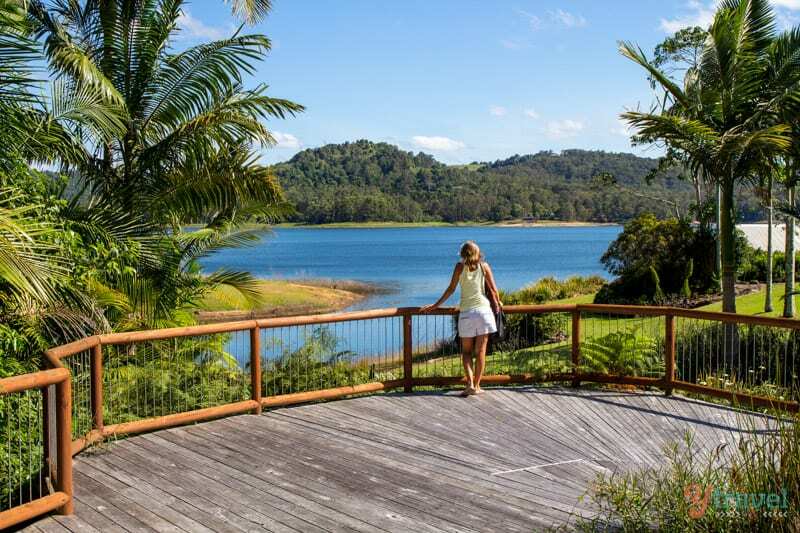 Looking for a romantic getaway in Queensland that doesn’t involve islands, scorching temperatures, and sand following you back to your cosy cabin? 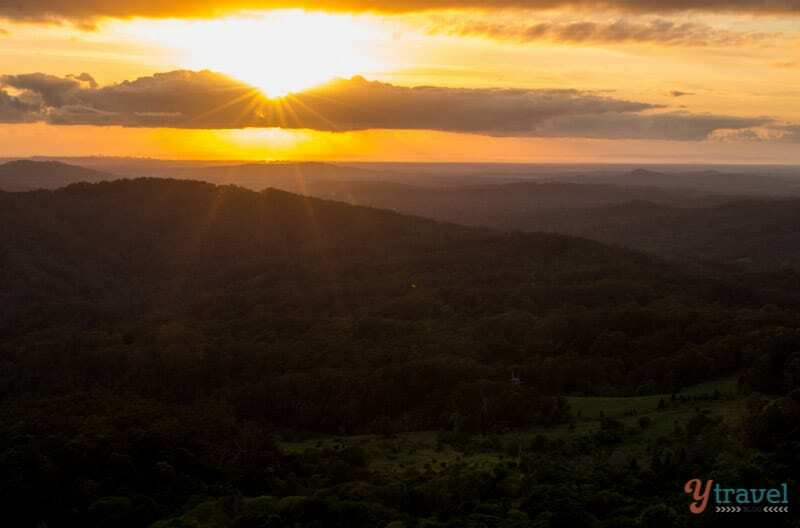 Consider the Sunshine Coast Hinterland. It’s not often Caz and I get away alone and reconnect as a couple, and recently we had a fantastic opportunity to do that whilst our kids reconnected with my mum. 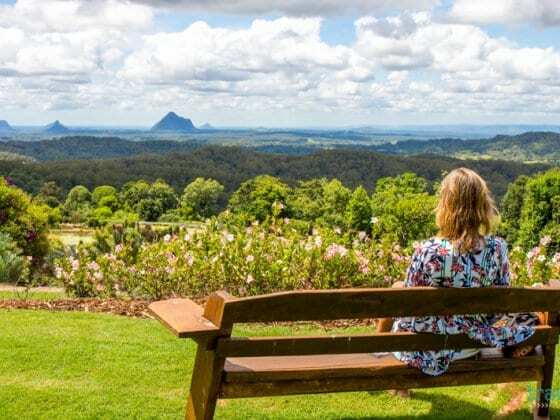 We flew nanny up from Sydney to spend a few days with the girls so we could escape to the Sunshine Coast Hinterland, and we hit the road from the Gold Coast with far less luggage than we’re used to – love ya work nanny! Just under two hours later and we were away from the Goldy and amongst the Hinterland of the Sunny Coast. If you’re leaving Brisbane, you’d be there in an hour. Our days ahead were to be filled with walks in nature, long lunches, wine tastings, majestic mountain peaks, massages, spa baths, uninterrupted conversations and serenity. 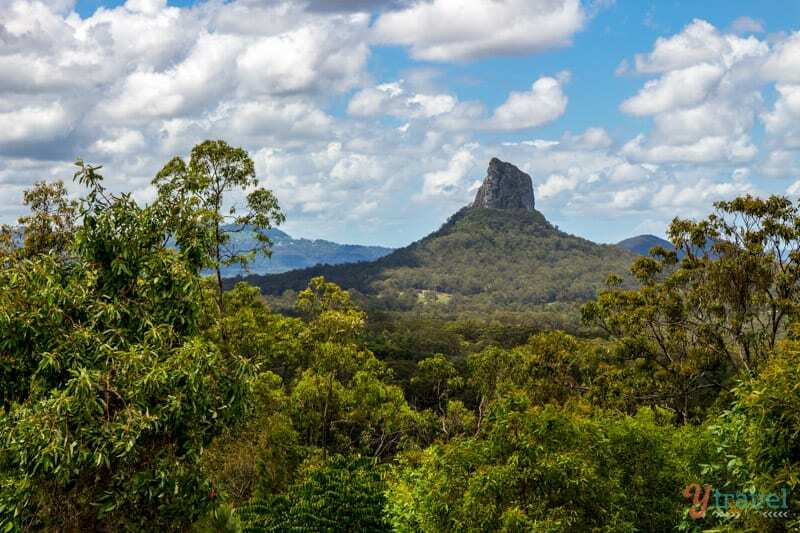 We headed straight for the Glass House Mountains with a quick pit stop at the Information Centre. Wherever we travel, we always make a point of visiting the info centre to chat with the locals in the know. After getting some insider tips, we headed to The Lookout, a short drive from town where you’re treated to an incredible 180-degree panoramic view of the mountain peaks. 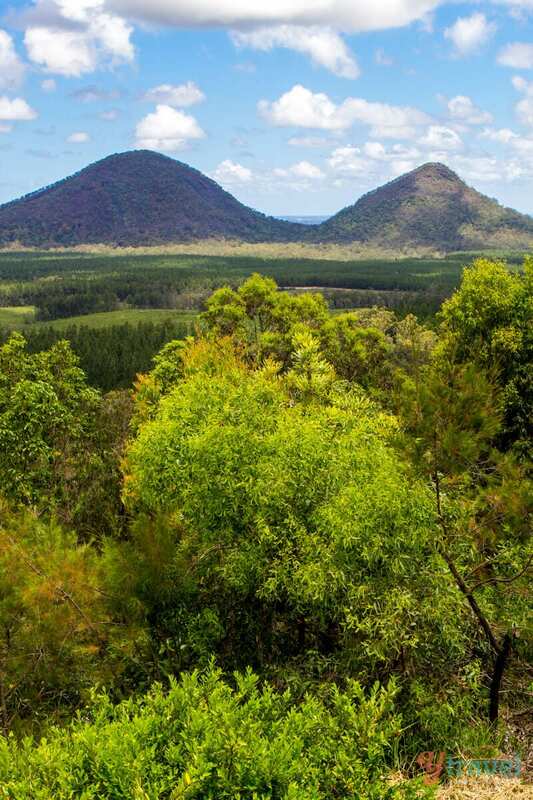 The Glass House Mountains are made up of 16 volcanic crags that rise up dramatically from the landscape. 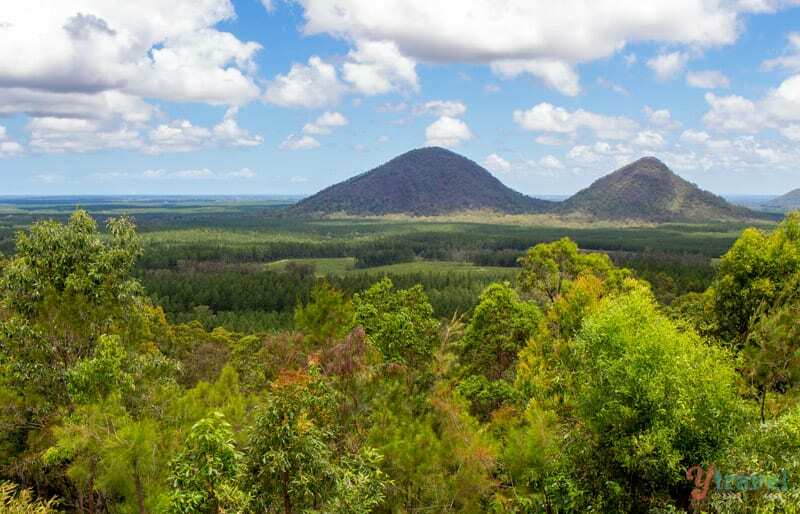 They’re said to be 20 million years old and a part of the Aboriginal ‘songlines’, navigational landmarks once used by Aborigines to find their way, and are a prominent feature of local Aboriginal legend. 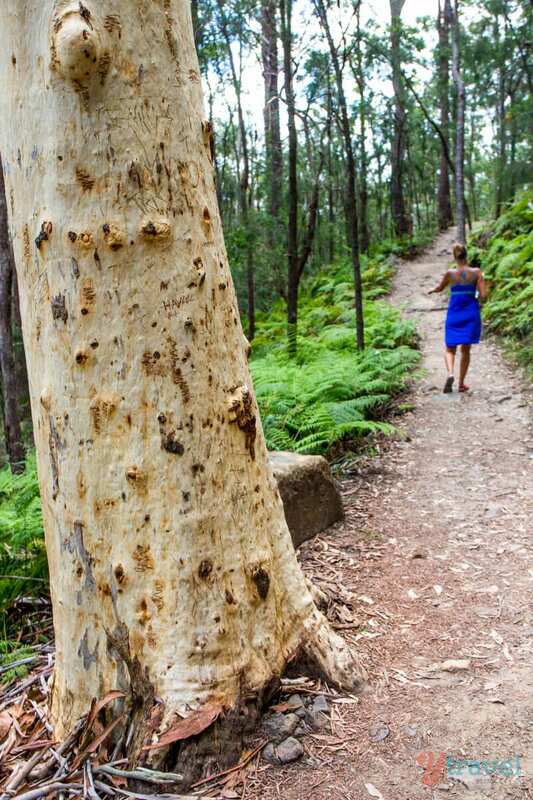 Whilst you might not see walking trails as a feature of your ultimate couple’s getaway, we love nature walks and the bonus of not having our kids present allowed us to move at an adults pace. When we reconnect as couple, a walk in nature is high on our list – treating our bodies and relationship at the same time. 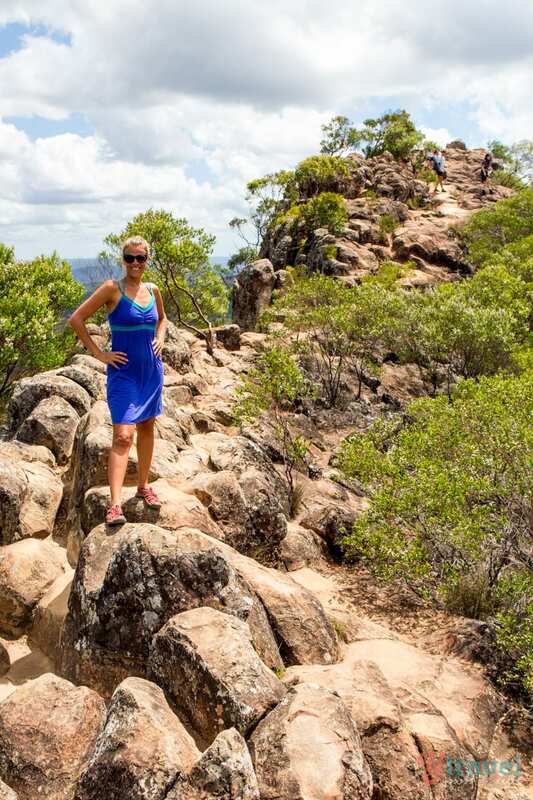 I recommend the Mt Ngungun walk. 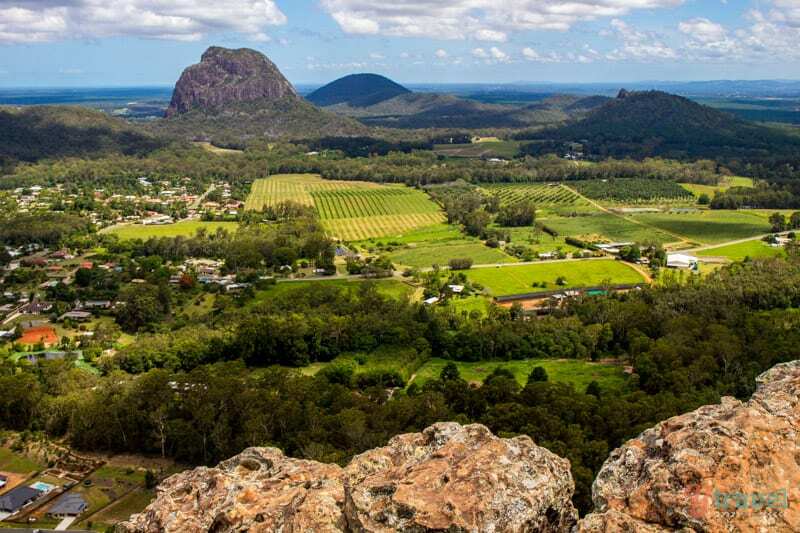 It’s an easy 2.8 km return walk up to the peak and you’re rewarded with spectacular 360-degree views of all four major peaks of the Glass House Mountains. 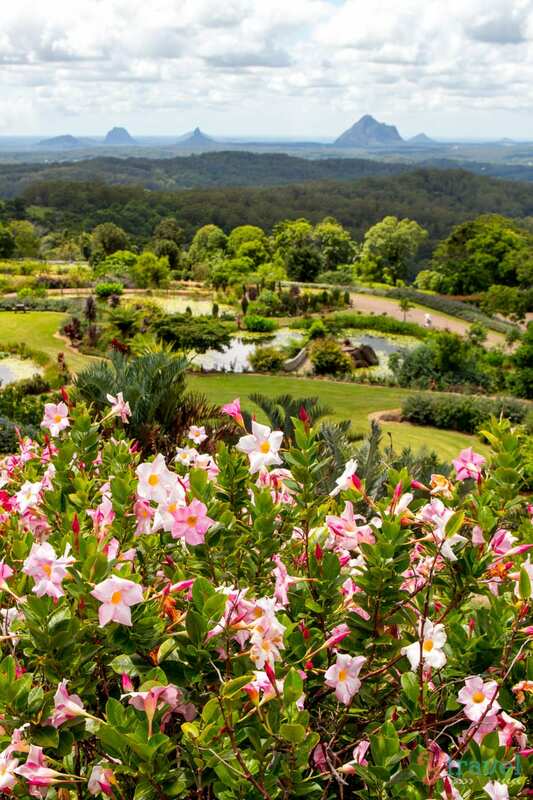 I had no expectations for the Maleny Botanic Gardens, and besides visiting the Royal Botanic Gardens in Sydney, I’m never one to get too excited about gardens. But wow, these gardens blew us away! Caz and I wondered around the 6 kilometres of walking paths for quite some time checking out all the water features, colourful plants and exquisite landscaping. 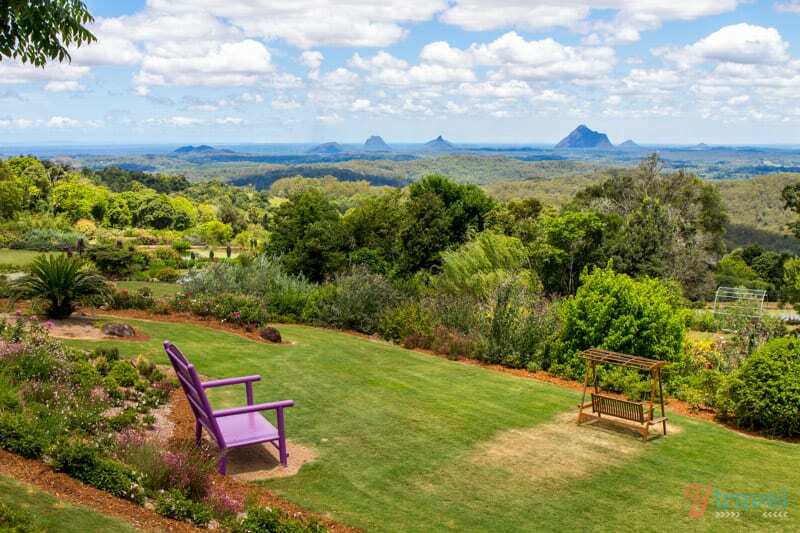 But the highlight for me is their location, they’re surrounded by rainforest with uninterrupted views of the Glass House Mountains to the coastline. Whilst there, check out the aviary tour. 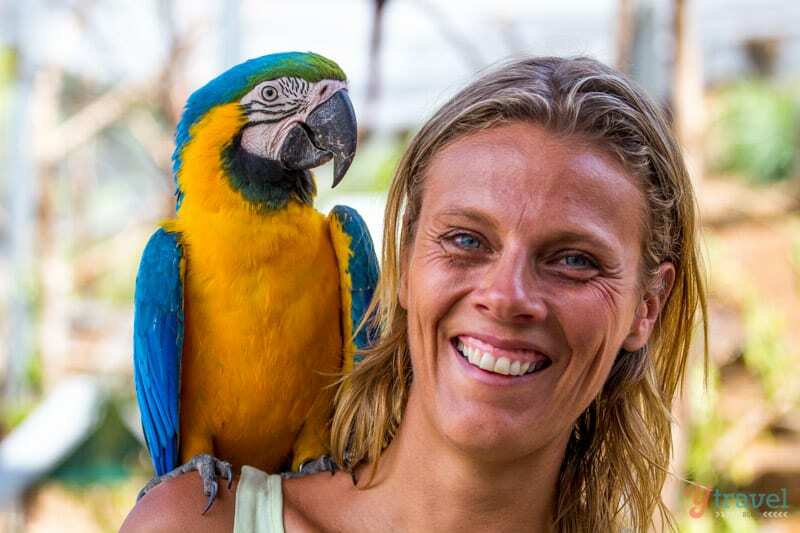 Caz got a good old laugh when I had a coloured macaw swoop down and perch on my shoulder, giving me a piercing squawk in my ear, the cheeky bugger! He was a lot calmer with her. Before leaving be sure to indulge in the Devonshire Tea. The scones with jam and cream were tasty and the coffee good. And how about more of these views! 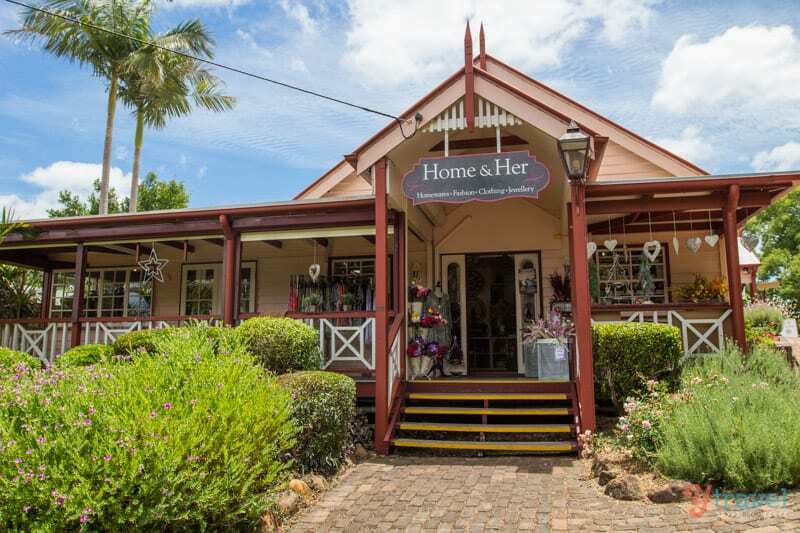 Caz was in her element with a spot of shopping in the charming villages of Maleny and Montville. They’re famous for their thriving arts community and have many artisan shops, boutique clothes, crafts and galleries for you to peruse. She found a great deal on a skirt at Carousel on Maple, a beautiful flowery and flowing cotton skirt for only $10. And next door was the locals pick for coffee at Shotgun Espresso. In Montville at Home & Her, she grabbed a few bright scarfs and jewellery for her and the kids. Then we wandered in and out of the numerous galleries and shops along the main street which is set in picturesque surroundings of a shady tree-lined street with views all the way down to the coast. What I most enjoyed was the architectural styles of the buildings ranging from Tudor to Irish, Bavarian and Swiss. 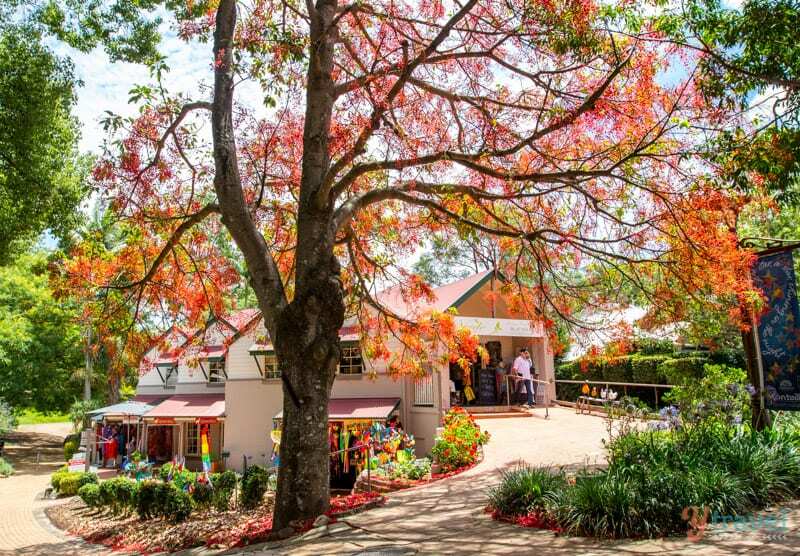 And the Flame Trees in Montville were in full bloom and mighty impressive! Another walk we did was at Kondalilla Falls through the ancient lush rainforests. 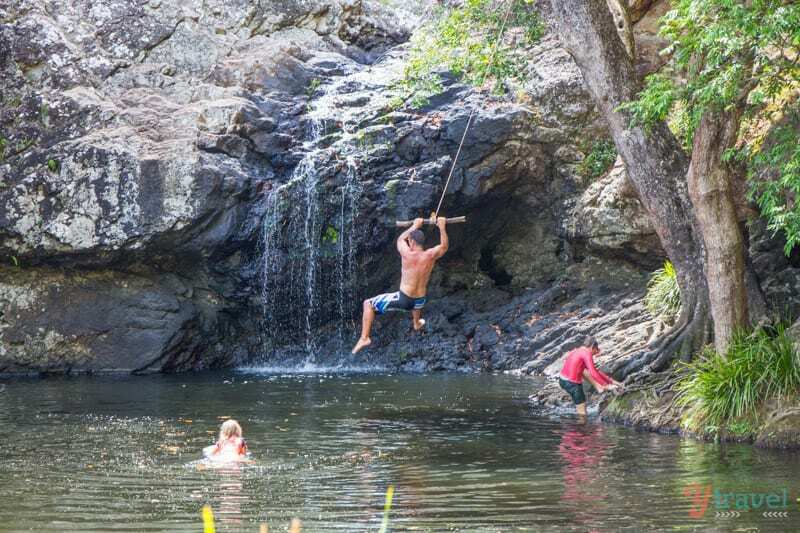 Depending on the time of year take your swimmers for a refreshing dip in rock pools on the way. The walk is a relatively easy 4.4km return, but can be a steep climb out if you go all the way to the bottom of the falls. 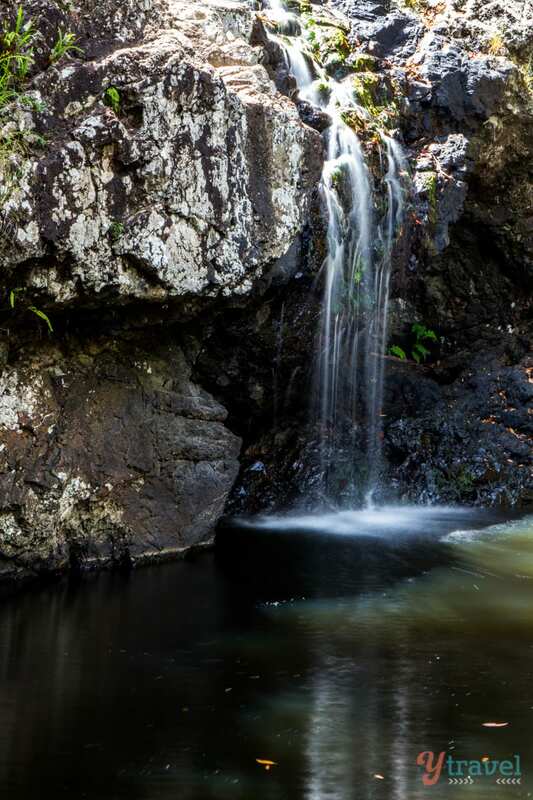 Unfortunately, there was no water flowing from the falls, but Kondalilla Falls is said to be spectacular and drops 90 metres into the rainforest valley. Now you have to get up early for this, and I mean ridiculous o’clock at 4.30am, and you’re probably thinking hey, I’m on a kid-free retreat I’m sleeping in! I totally hear ya, and I did that on the other two mornings but I’m glad I made the effort on one occasion to start my day with the sun rising up over the ocean and Caloundra on the coast. 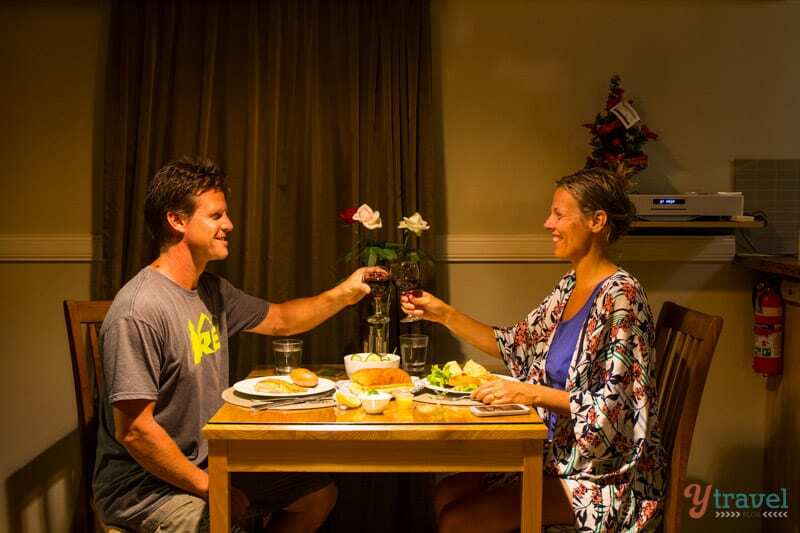 Relaxing over long lunches and eating out at fancy restaurants is made possible on a couples getaway. When do you get to do that with the kids around? I mean we do, but if you’re a parent with young kids you know it’s never really relaxing. 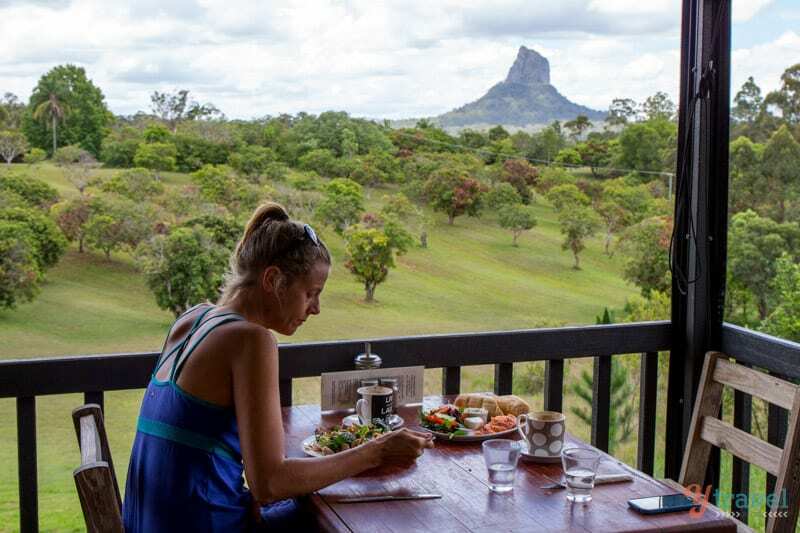 Many of our lunchtime dining options provided us with incredible views over the hinterland and out to the ocean. 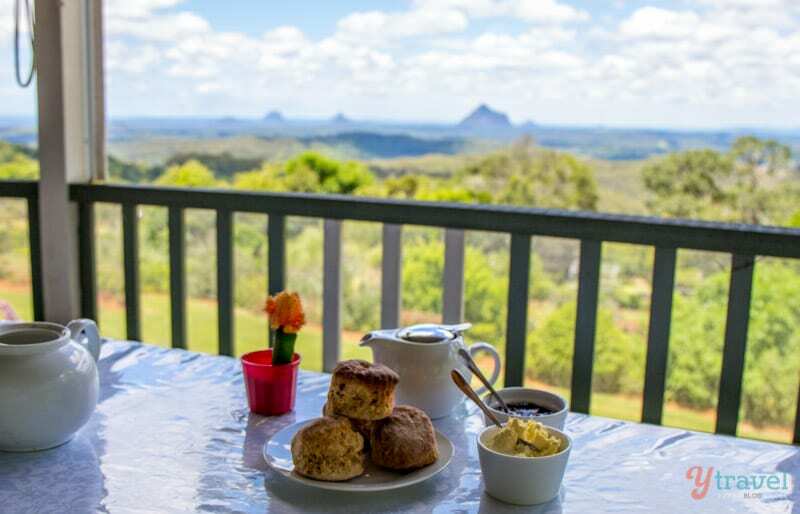 Our visit to the info centre at the Glass House Mountains coincided with lunch and the ladies recommended the Lookout Cafe. Great suggestion! I had this huge and delicious sSmoked salmon baguette and Caz enjoyed her chicken and mango salad. 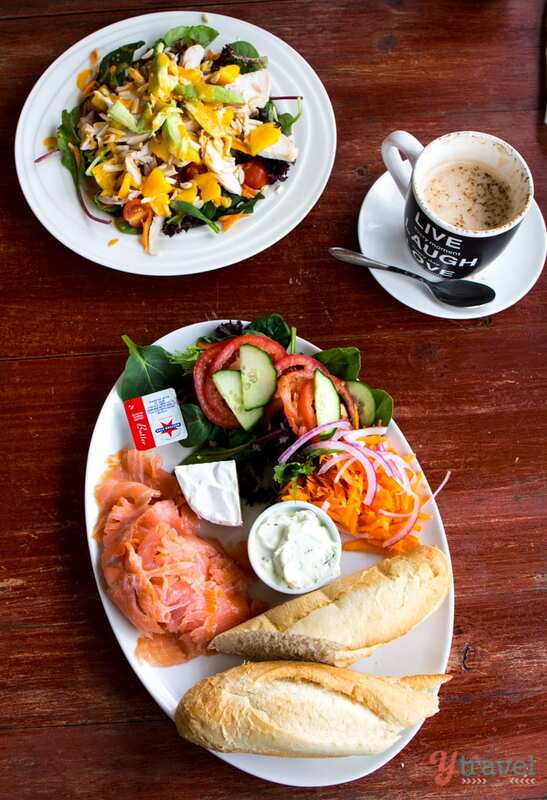 And they don’t call it the Lookout Cafe for nothing! If you’re a chocoholic like me and enjoy a coffee or tea, then a visit to Montville has to include the Mayfield Patisserie & Chocolates. We sat down for a mug of coffee and a yummy raspberry chocolate mousse. There’s another reason to come here, those views over the valley to the coast! Next door with the same view is The Edge Restaurant which comes recommended. 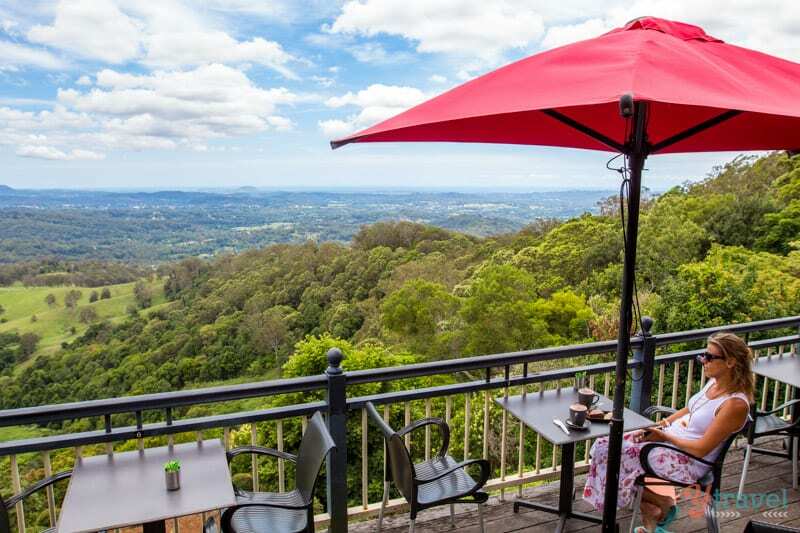 Also in Montville, Poets Cafe is a charming building that overlooks the valley and coastline and a relaxing spot for lunch. 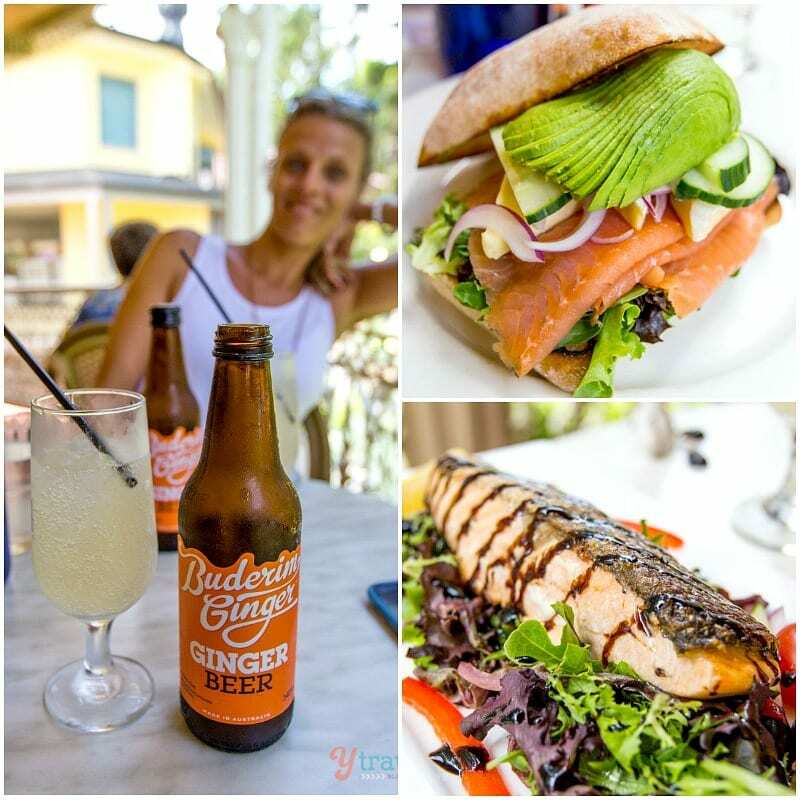 I had another smoked salmon baguette washed down with a local ginger beer from Buderim, a refreshing drop on what was a humid day, and Caz enjoyed the salmon fish special. 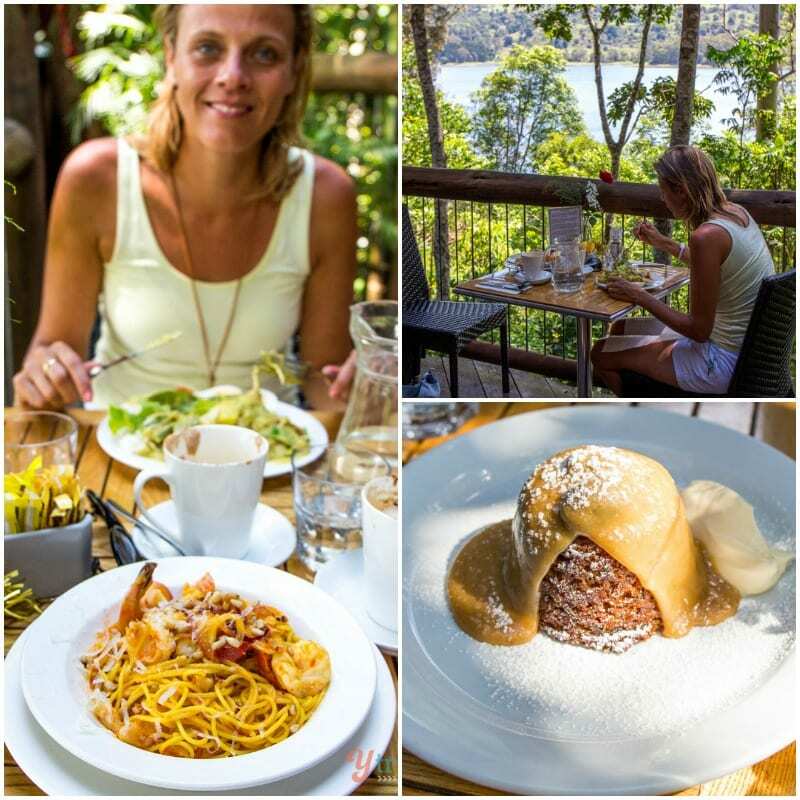 We didn’t even know there was a lake near Montville, and a great way to take in the views of Lake Baroon is by heading to Secrets on the Lake for breakfast, brunch, or lunch. The cafe is situated in the rainforest right next to the lake providing panoramic views of the water, mountains and rainforest. My spaghetti didn’t disappoint and we both topped up with my all-time favourite, sticky date pudding! If you’re in need of some fine dining, put dinner at the famous Long Apron Restaurant, inside Spicers Clovelly Estate on your itinerary. 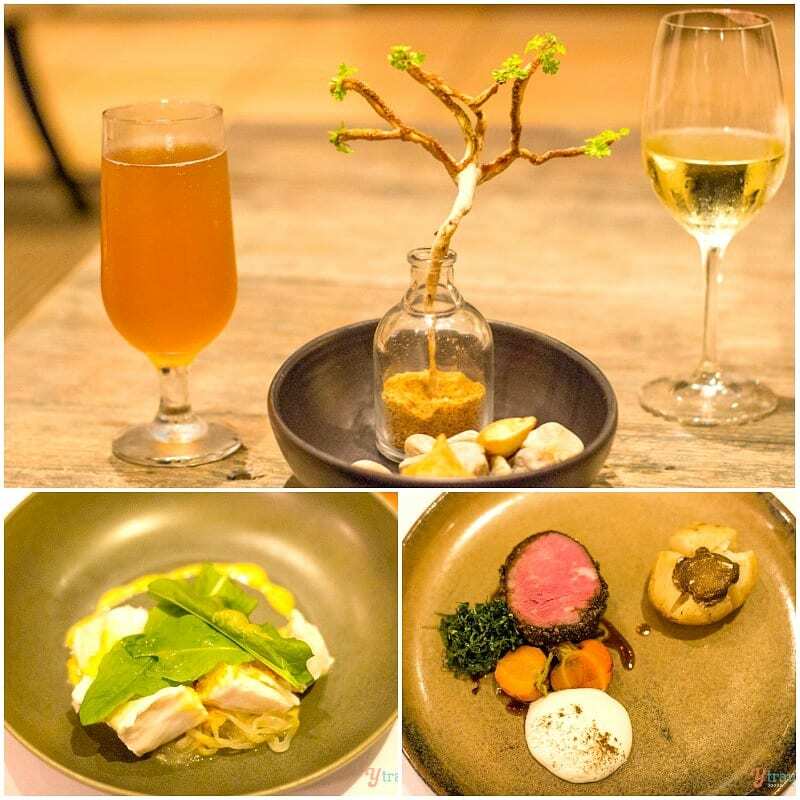 At this award winning restaurant – it’s ranked in the Top 100 Restaurants in Australia by The Australian Gourmet Traveller – our night started off with a pre-dinner drink and an edible tree, how cool is that?! And continued over good conversation, dimmed lights, lovely red wine and food that lived up to its reputation. 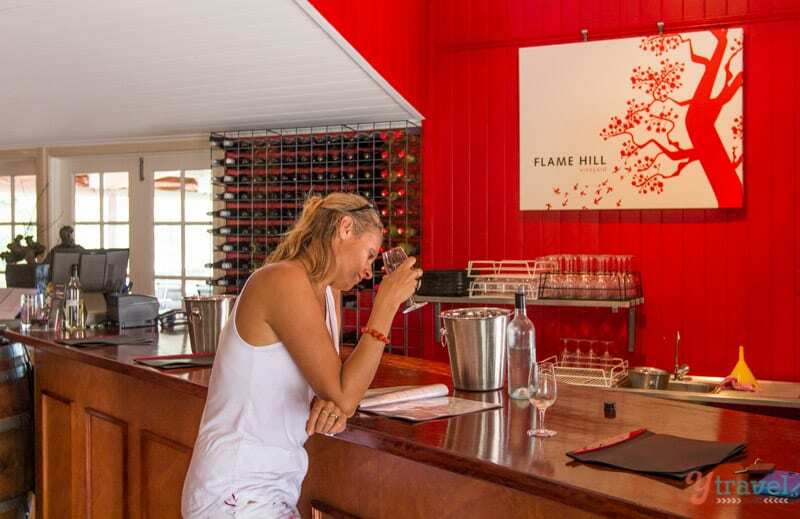 I’ve said it before, Queensland is full of surprises, and a visit to Flame Hill Vineyard proved to be another pleasant surprise and reinforced that Queensland has good wine! After tasting a few wines at the cellar door we retreated with a bottle to a table offering picturesque views over the surrounding bmountain vistas. 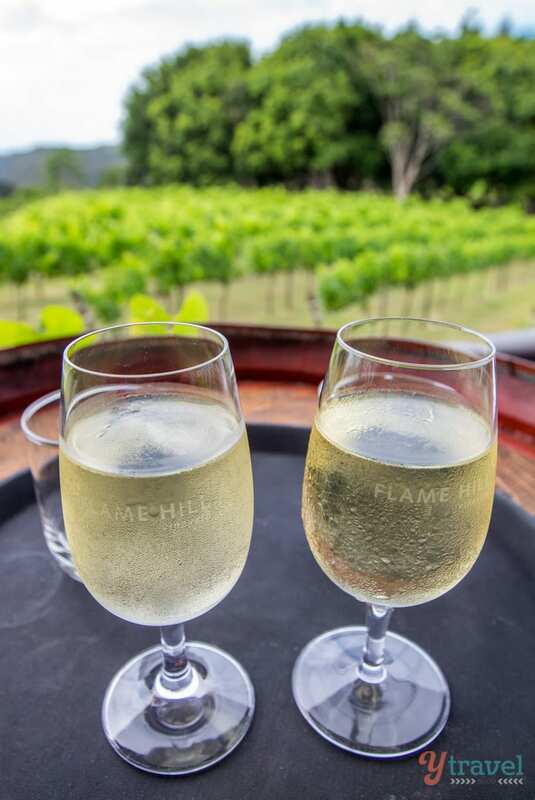 It’s a lovely setting within a contemporary Queenslander, and I think our next trip back up to the Sunshine Coast Hinterland will include a lunch date at Flame Hill. For something a little more casual on our final night, we jumped on the courtesy bus to the Montville Bar & Grill. I love a good beer garden, and the ambience outside on a warm night was light, fun and friendly. 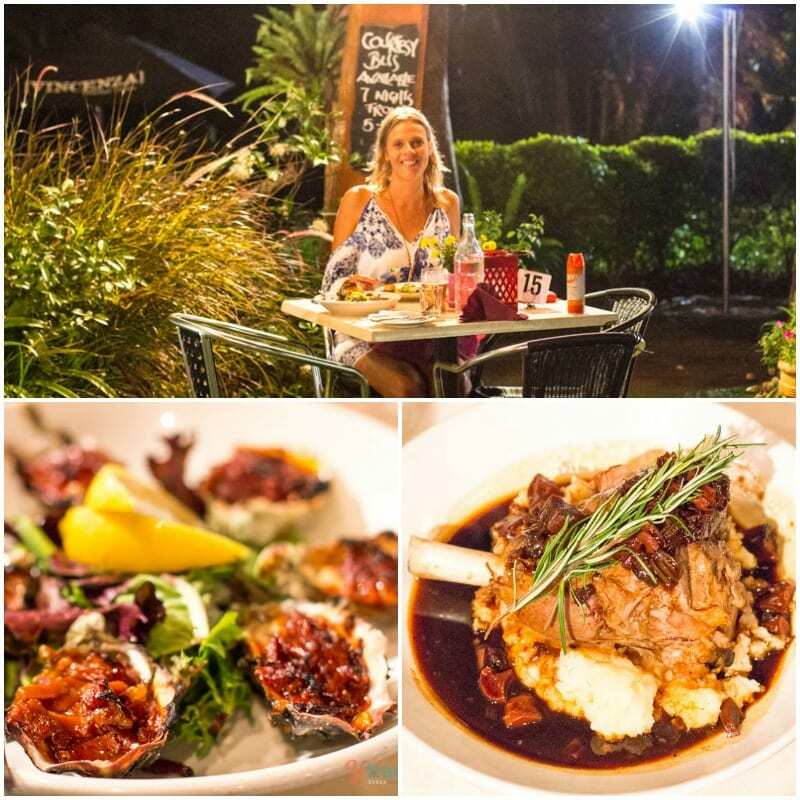 And my oysters and southern sticky lamb shank was sensational. I can envision myself back here on a winters night, all cosy inside the black and white tudor building enjoying a hearty meal and a nice pint of Guinness on tap. Ahh, memories of the UK! 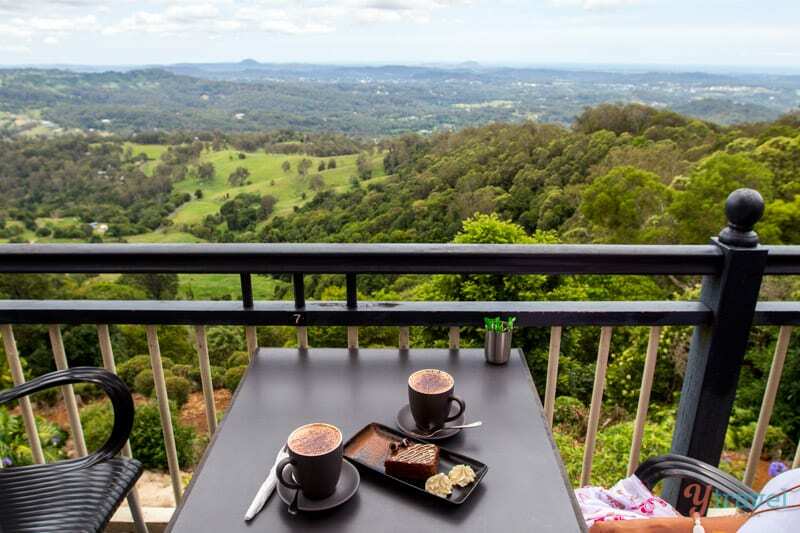 I’m convinced we found the ideal couples retreat in the Sunshine Coast Hinterland, but I’ll let you be the judge! 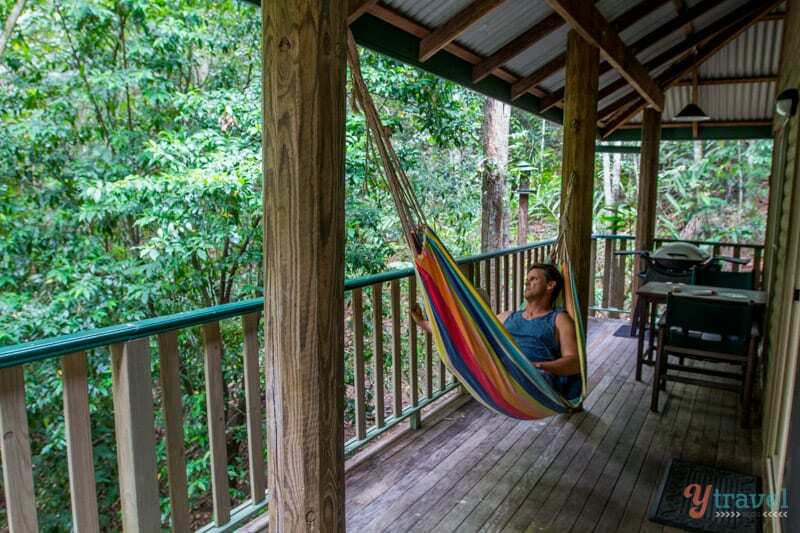 If the idea of swinging in a hammock on your private deck in the middle of the rainforest with king parrots swooping past to grab their afternoon snack from the bird feeder sounds like you, read on. 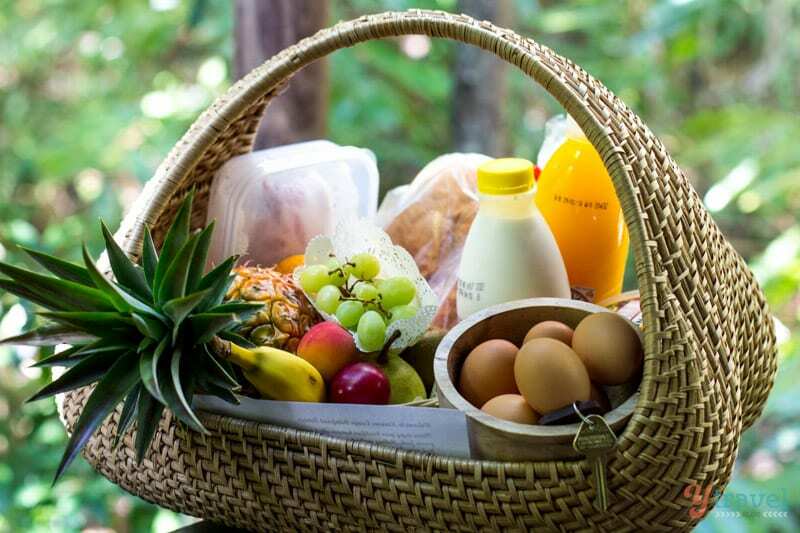 If freshly baked croissants or muffins delivered to your cottage of a morning, along with a gourmet breakfast hamper filled with local produce appeals to your appetite, stay with me here. If a BBQ dinner of delicious fresh salmon cooked in the Weber on your deck and either eaten outside or brought in to have a candlelit dinner with your favourite tunes playing appeals to your senses, continue on. If a massage between activities to work away those tired and tense muscles from the comfort of your living room sounds too good to be true, this can be your reality too. 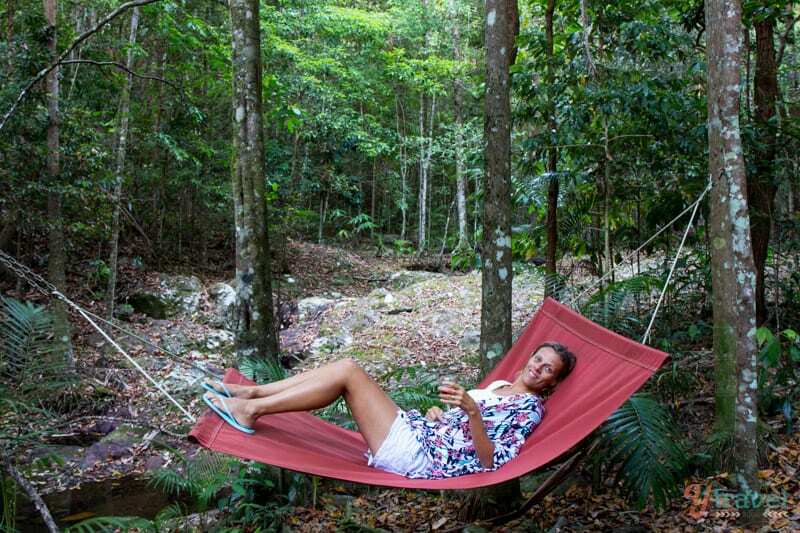 If a walk along a private nature trail with a glass of wine in hand – yes they encourage this – that includes wifi so you can tease your friends online if you feel inclined whilst you swing in your “other” hammock, raise your hand. If a refreshing dip in a pool surrounded by rainforest is on your list, they’ve got you covered. 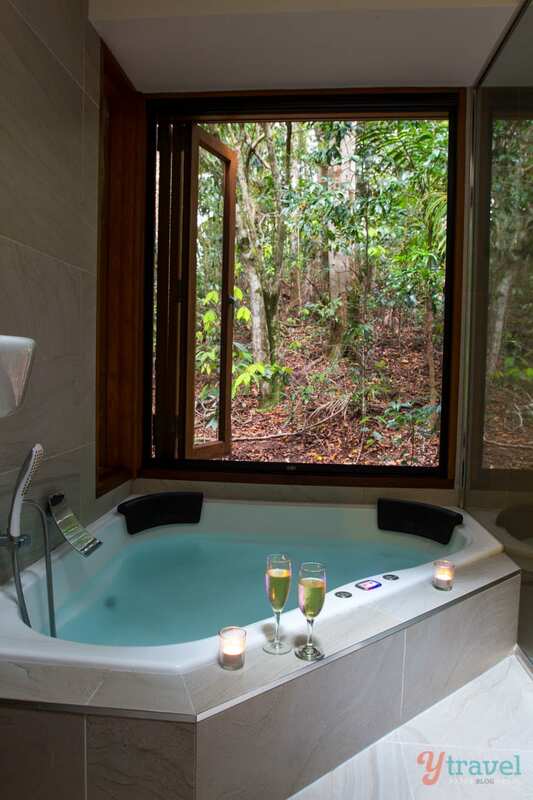 Then there’s only one thing left to do when you arrive: light the candles, grab a glass of champagne and slink into the deep double spa bath with the rainforest as your backdrop. 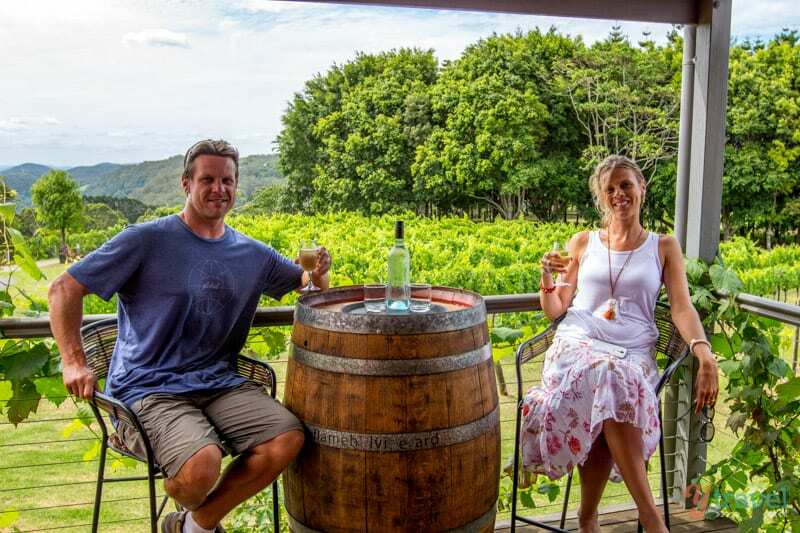 I’m talking about staying at Narrows Escape Rainforest Retreat in Montville, accommodation specially designed for couples. Our pavilion, one of only six, was surrounded by sub-tropical rainforest bordering Kondalilla National Park. 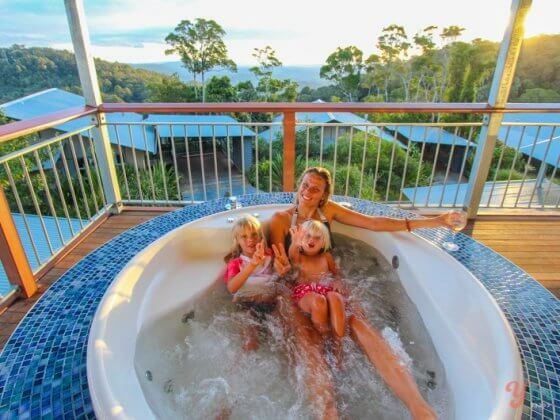 It was hard leaving this property in Maleny and exploring the region each day, we were that relaxed, but it proved to be the perfect base to come home to each afternoon and unwind. 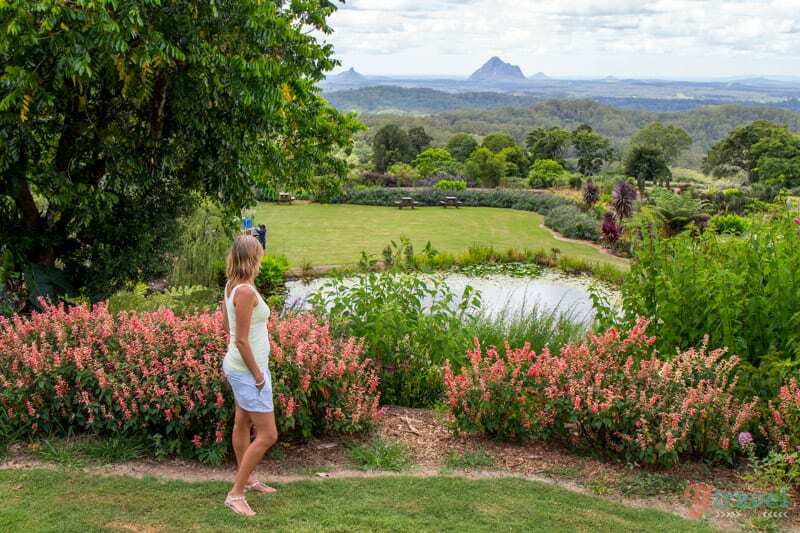 Our couples retreat at Narrows Escape in the Sunshine Coast Hinterland wasn’t just about us reconnecting with each other, which we did a lot of, but about reconnecting to nature uninterrupted. What better gift can you give your children than to return home a better version of yourself with waiting arms to swoop up your kids with love and a high-five for nanny? I think we need to fly nanny up from Sydney more often! 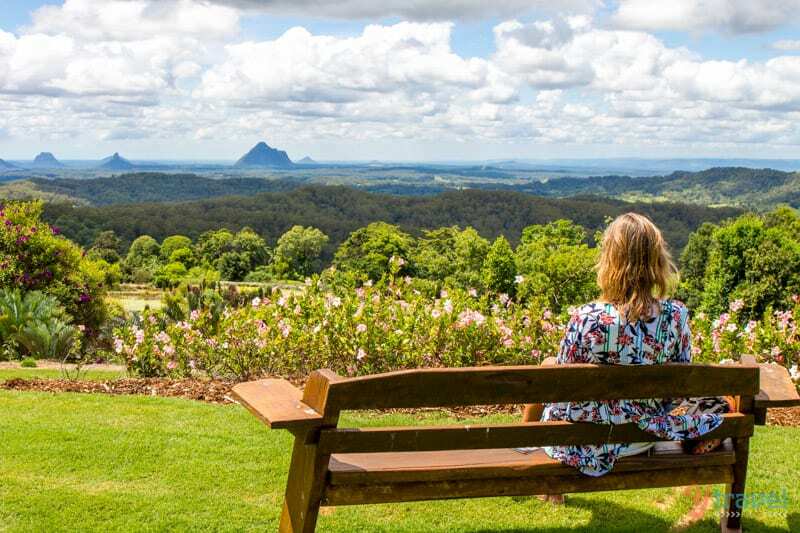 We partnered with Tourism Queensland for this getaway and for more detailed information on the Sunshine Coast visit their official website. 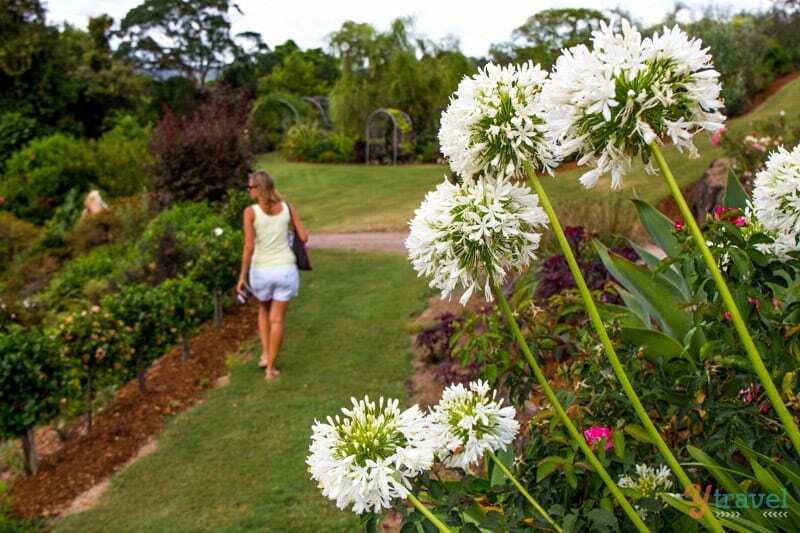 Have you explored the Sunshine Coast Hinterland? What was your favourite moment? Or which one of our experiences would you like to do? 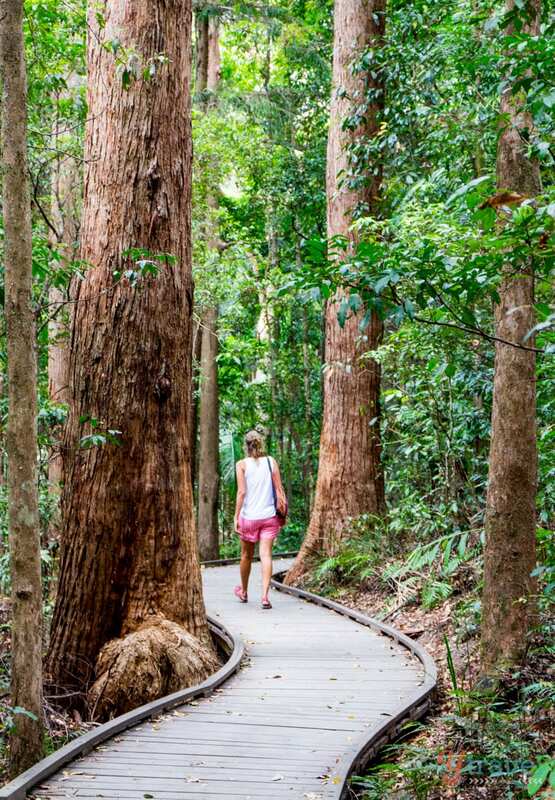 14 things to do on the Sunshine Coast that don’t involve the coast! 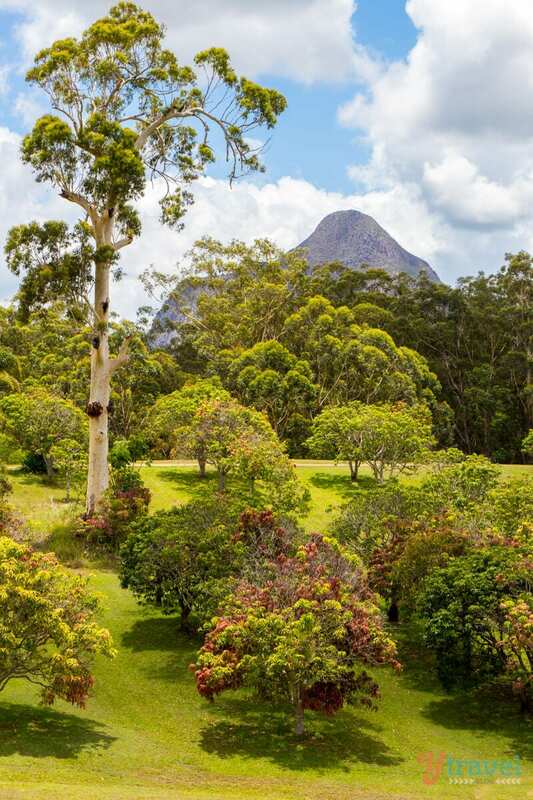 The Botanic Garden and Kondalilla National Park look amazing to visit. It almost look like a trimmed combination of jungle and european terrace and forest. I didn’t imagined that Australia would have such a place. Definitely a very impressive garden Linda, and that’s coming from someone who doesn’t spend a lot of time admiring gardens! Ha ha, nothing to worry about on the animal front. There’s a lot of other places and situations around Oz you could put yourself in harms way than the Sunny Coast hinterland. You definitely need at least a month if your visiting from overseas, it’s a big backyard we have! Yes, that I know. I imagine that it takes just forever to get with the car on the coast, let alone from Melbourne to Perth. The country is huge by size, with a lot of open space with no that many things, but between those, you can sometimes find “the oasis”. And most of those thing I can find on your lovely blog , full of good info for those who want to visit Australia. 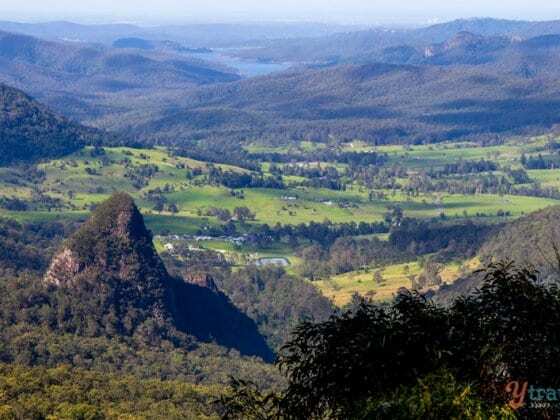 I love the Sunshine Coast Hinterland. I recently explored the Glass House Mountains for the first time and was in awe of these magical set of mountains. 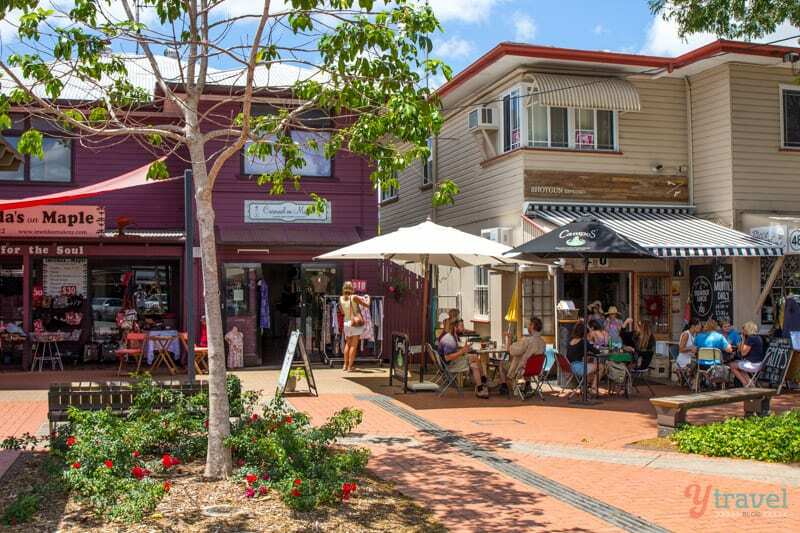 During my trips up to the Sunshine Coast to visit my daughter, we often drive out to Maleny and Montville on a day trip. 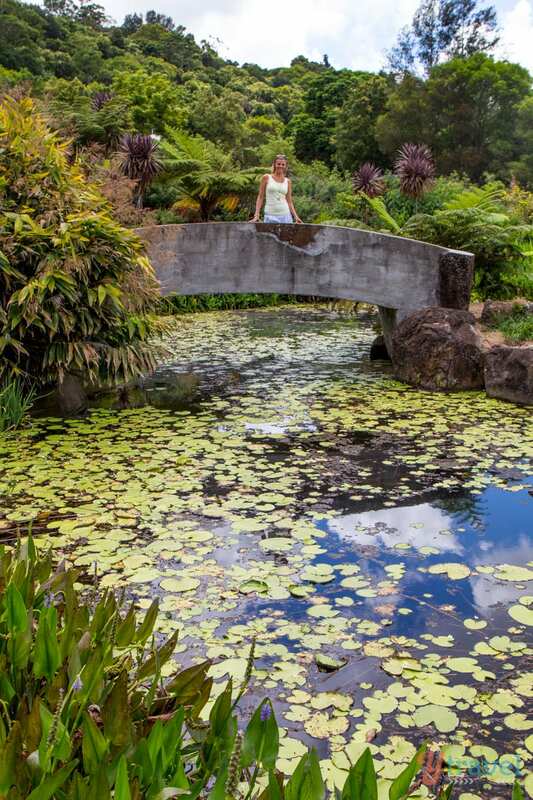 Next time we will have to check out the Botanic Gardens, they look magnificent. What a beautiful place for a romantic weekend for two. Fabulous photos!